First, I want to compare them by price. 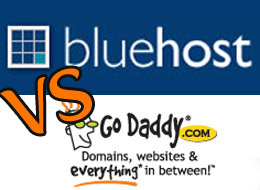 While Godaddy provides a cheaper offer at $4.99/month, compared by the number of features offered, Bluehost comes first at only $6.95/month at unlimited databases and emails. The same unlimited plan costs $14.99/month at Godaddy. While every hosting provider has periods of downtime, I have noticed about the same down-time for both, whenever they have a maintenance going on. The sites powered by WordPress are loading noticeable faster on Bluehost. Here, I refer mainly at the time the connection is made to database, before even the site is being loaded. At Godaddy, that waiting is longer by 1-3 seconds depending on the database size. I do not even want to mention the hosting provider FatCow where this waiting time is 15-20 seconds! In case you want to have plug-ins or additional functionality running properly, DON’T sign up with Godaddy! I remember I had a very bad experience in the past, when a client of mine wanted a newsletter software installed on his Godaddy server. I managed to install it, but than, it would not send mass emails. Testing the same functionality on Bluehost, it worked with no problems. Speaking with Godaddy technical support, they told me we need to upgrade the account and pay like $150/month, so we can have that feature supported! No thanks. Bluehost has more features configured and installed! Another bitter experience with Godaddy, it was when we have lost information on a website we were developing, with no manual back-up at that time. After we figured out some problems with the content and that after few days, we found out that Godaddy only stores the back-ups for 1 day. If you need to go to an earlier date, their programmers need to go in there manually and restore it for you for the cost of $150. Your mistake your pay! In exchange, on Bluehost they store the back-ups for 30 days so you don’t even have to worry about using your own back-up manager. Bluehost is more trusted! Godaddy plays dirty! For some unexplained reason, on Godaddy, whenever we make a fresh install of WordPress we need to wait at least 30 minutes for the database and username to get created. In case you need to change the FTP password you need to wait another 30 minutes, waiting precious time just waiting when you have that deadline in few days. I haven’t heard of such non-sens on other hosting providers including Bluehost. Both companies respond in pretty quick to phone calls, however on Godaddy the waiting is higher due is a large company with more clients. What I liked on Bluehost, is that sometimes they do things for you and they really want to help without charging you extra. On Godaddy, they always try to up-sell or have no clue about my problem. Bluehost support is more professional! Because I love working with WordPress on Bluehost, save me time and money to clients in long run, I became a proudly Bluehost affiliate; in case you still haven’t decided on a hosting provider I strongly recommend you sign-up: http://www.bluehost.com/track/fldtrace/CODE13. While Godaddy is a very large company and can focus on marketing better, that’s a reason why everyone heard about and trust them, while they should not. What is your experience with both? Is there any other good hosting provider worth considering? Having been with both hosting companies in the past, I can say that you are absolutely correct on every point. I started with GoDaddy and after 6 months and an amazing amount of trouble and headaches I moved all my sites over to BlueHost. I love BlueHost and highly recommend them to anyone needing inexpensive hosting with great customer service. Totally agree with you Jim. Thank you. I´m going to moved on bluehost. I found this article quite interesting. I have more than a few websites with GoDaddy, on their shared hosting. I’m thinking of expanding to a new company because their speeds are nothing to be proud of. Website loading time is precious, slower the load time the faster you lose someones attention. 4.- The possibility of installing wordpress, joomla and drupal manually or from the control panel. 5.- I dont care much about email but would like to know how many megabytes of email i can use. Does bluehost have all this on a plan which is around 100 dollars per year?? Hi Luis, yes Bluehost has everything unlimited.